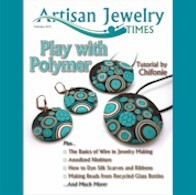 Artisan Jewelry Times is no longer being published. However, you can still purchase back issues. 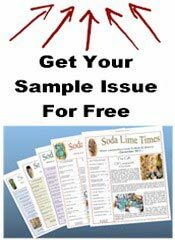 to Return to this page, click on "Continue Shopping"
This issue is crammed with inspirational photographs, enriching articles, examples of mind-blowing creativity, gee-whiz materials and techniques, and step-by-step tutorials that will expand your realm of what is possible. 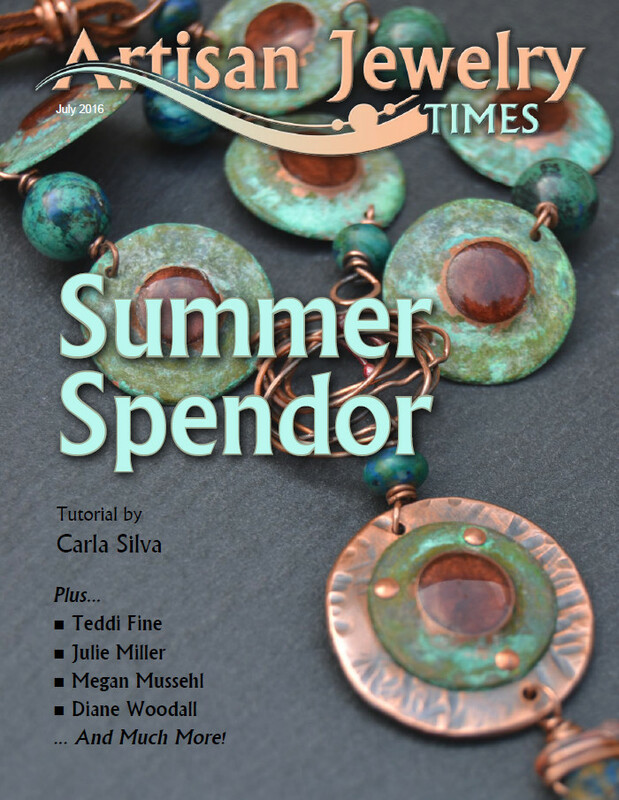 Included in this issue: The Featured Artist: Marti Brown, by Leah Nelson | Anodized Niobium Necklace and Earrings, by Marti Brown | The basics of Wire in Jewelry Making, by Joanna Tiritilli | Giving Back to the Art Jewelry Community, by Karen Leonardo | Focus on Fabulous – Patricia Tyser Carberry, by Diane Woodall | Color of the Month, Minty Opal, by Tracey Alfaro and Diane Woodall | and Earring Inspiration, by Karen Leonardo | Tutorials: Making Beads from Recycled Glass Bottles, By Julie Delaney; Wine Bottle Glass Bead Memory Wire Bracelet, by Julie Delaney; Dyed Silk Scarves and Ribbons, Kris Ball; Shrink a Piece of Metal or Two, by Shonna Neuhart; and Ethnic Chic Bubbles, by Chifonie. 65 Pages. 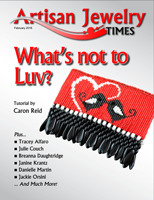 In this issue is exciting and informative content worthy of a king’s ransom. 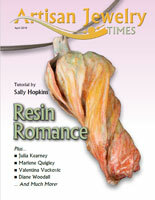 The featured artists the famous Sherry Serafini, a world-renowned seed bead artist, author, and teacher. 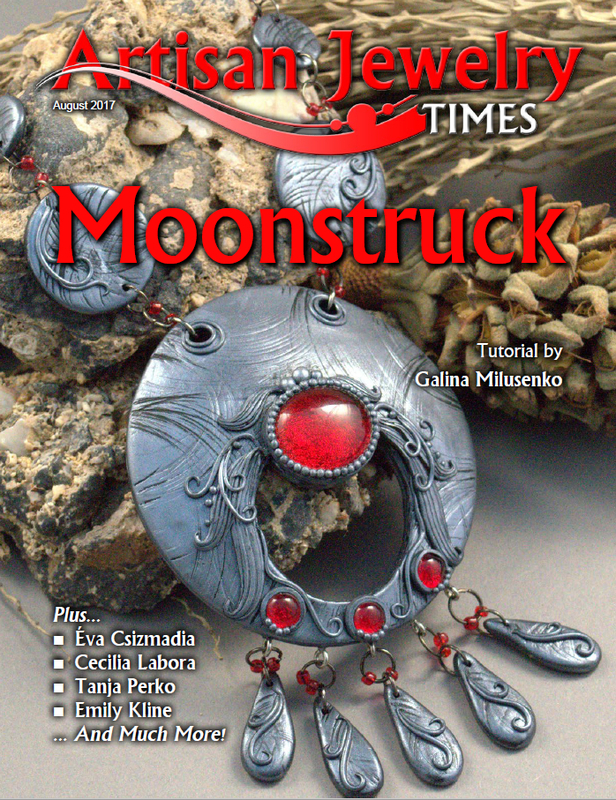 She provides a dazzling tutorial called “Bead around the Moon,” a beaded embroidery pin. 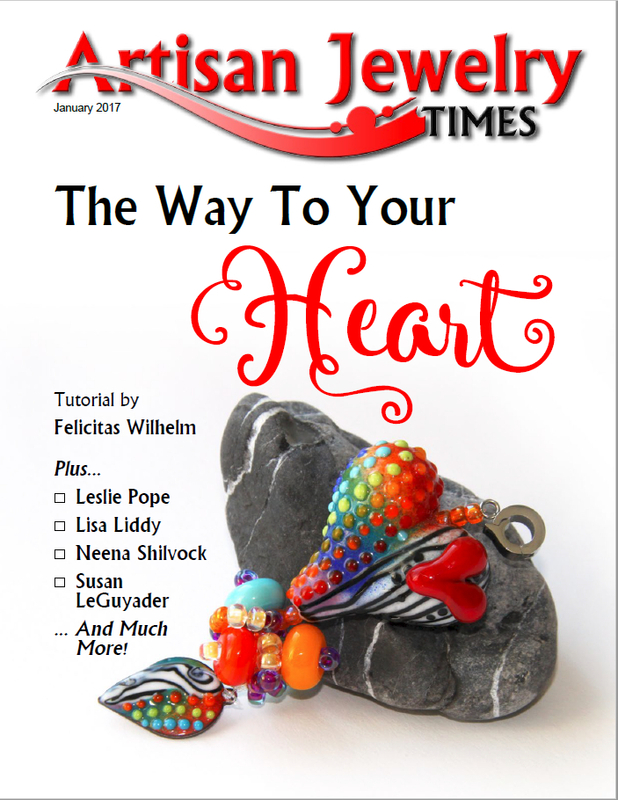 | Articles include Picking the Perfect Opal, by Leah Nelson | You Can Write – Making Your Article a Success, by Karen Leonardo | focus on Fabulous with Windy Baker, by Tracey Alfaro | Color of the Month, Brilliant Sapphire, by Diane Woodall | Earring Inspiration, Seed Bead Creations, by Karen Leonardo. 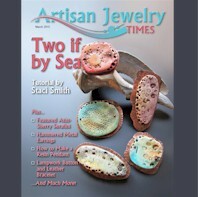 | Tutorials: Two if by Sea – Polymer, by Staci Louise Smith; Funky Hammered Steel Wire Dangles, by Gina Cuff; Organic Lampwork Bracelet Button, by Kathryn Legassey; Double Wrap Leather Bracelet, by Kathryn Legassey; Resin Pendant, by Patty Hevly; Simple Wire Work Squiggle Necklace, by Patti Cahill. 69 Pages. 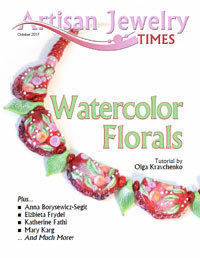 — The beautiful cover necklace was made by the featured artist, Irina Sergeeva, an amazing jewelry and lampwork artist. 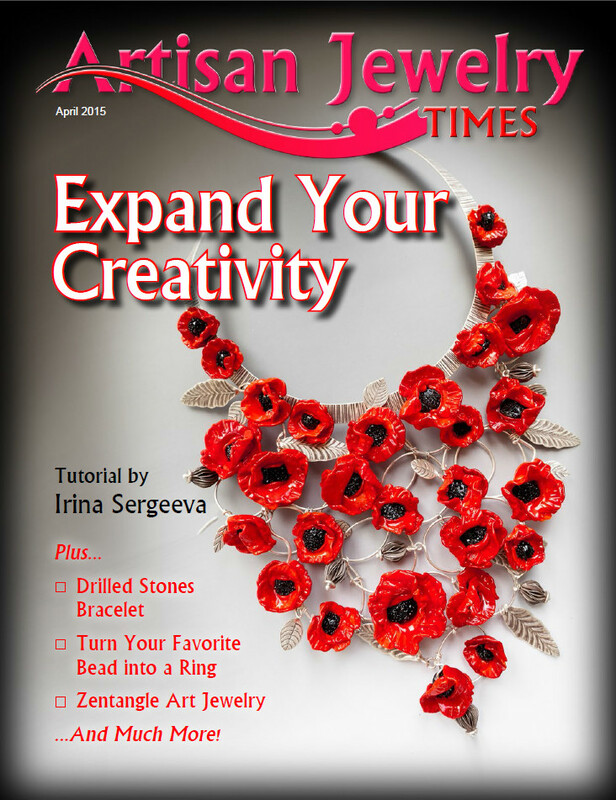 Her tutorial in this issue is how to make poppy beads and use them to create a stunning silver collar. 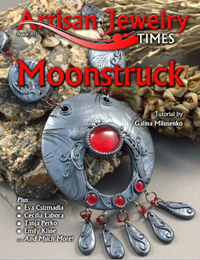 | Color of the Month is Gothic Red; and Earring Inspiration looks at the popular Steampunk style. |Focus on Fabulous features a stunning piece by Caroline Fung. 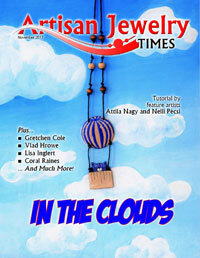 | Articles include: Bead Retreats by Peggy King; Ideas on studio design by Kieu Pham Gray. 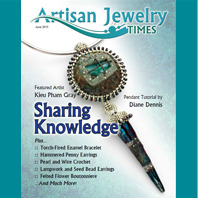 | Tutorials: Drilling stones and a “Rockin’ Wire Bracelet” by Kieu Pham Gray; a Kumihimo Necklace, called “Sparkling Pansy,” by Darlene Mansue using Nolly Gelsinger’s lampwork pansy flower bead; “Compass Rose” seed bead bracelet by Leslie Pope; “I Love my Beads” wire wrapping ring by Ronda Stevens; a Zentangle inspired pendant by Nancy Loomis, rounds out the tutorials. This month the featured artist, Lenart Kazmer, not only is a terrific artist, she developed Ice Resin. She shares her how-to’s on an industrial chic sgraffito pendant. | Learn about family businesses Green Girl Studios and other family business partners working together, by Sally Stevens. | Our color of the month is Lime Margarita (hold the salt), with a generous sampling of unique lime components for good measure, by Diane Woodall. 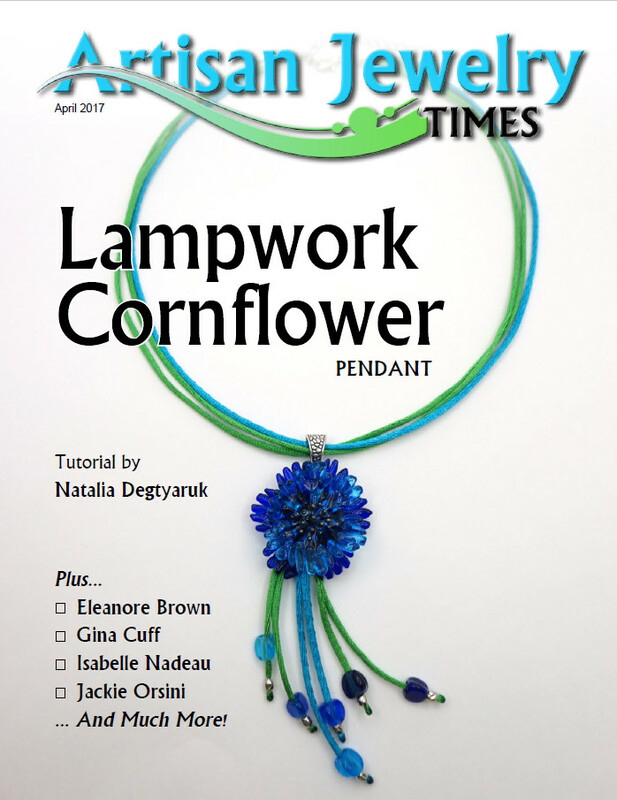 | Earring Inspiration blooms flowers this month, and Focus on Fabulous features a stunning shibori necklace and earrings by Serena Di Mercione; article by Tracey Alfaro. 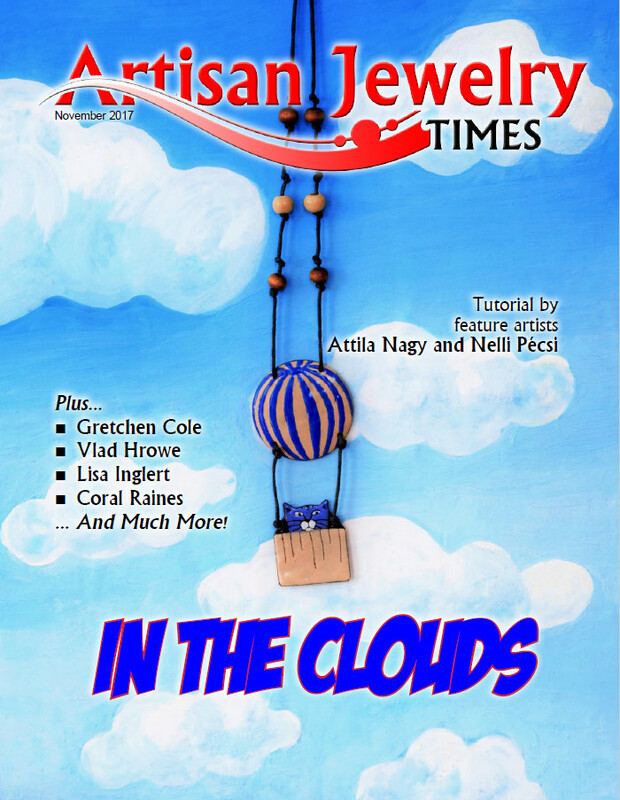 | Jewelry tutorials are: stone like Lampwork beads by Sheila Checkoway; rolled paper beads, by Vicki Dehne; square beads, wire and pearl bracelet, by Elzbieta Frydel; and, a Ganesha pendant from clay, stringing and wiring gems, by Jenny Davis Reasor. 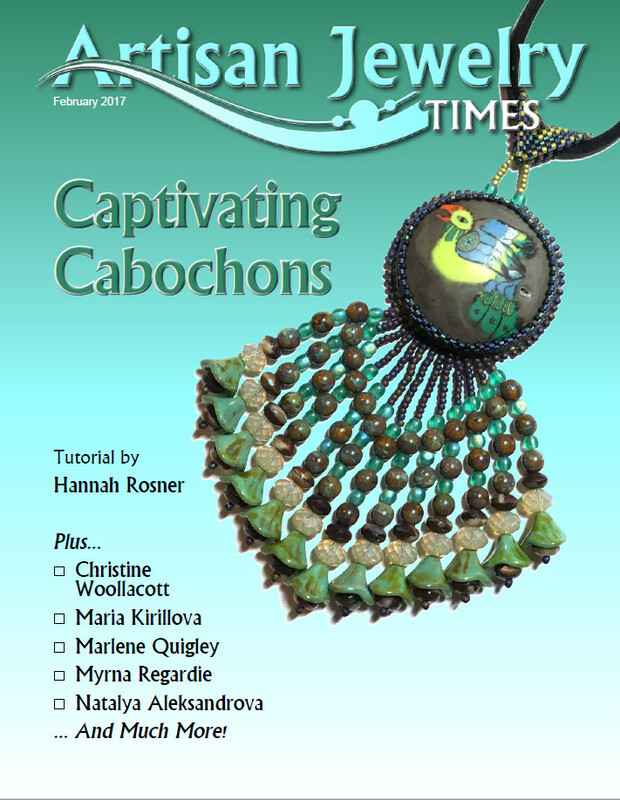 This month features a variety of versatile, inspirational and fun articles, features and tutorials. The featured artist, Kieu Pham Gray, is a teacher and artist of renown. 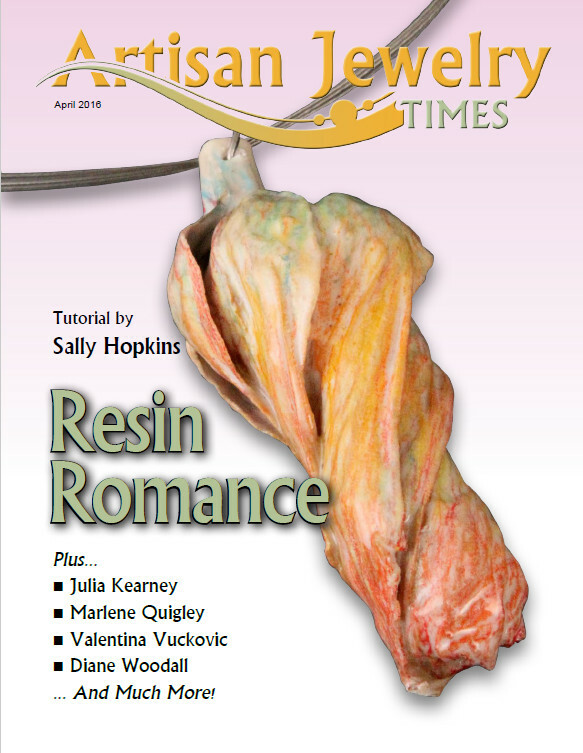 She shares her journey and her passion for teaching, plus offers an outstanding tutorial on torch fired enamels. 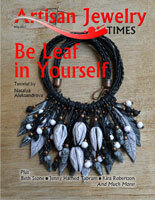 Focus on Fabulous features Debre Gyongyi’s “bird nest jewelry with wire and pearls. 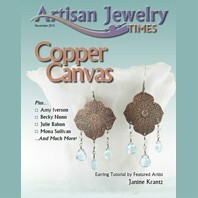 Gina Cuff uses now obsolete Canadian pennies to make copper earrings. 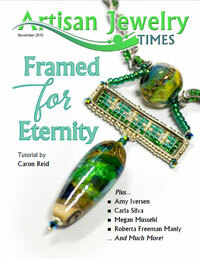 A seed bead offering by Diane Dennis, a raku pendant was our cover piece this month. 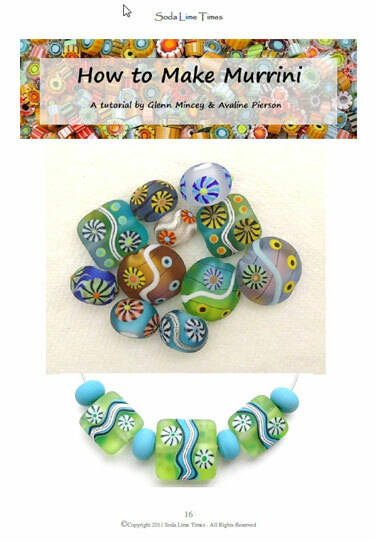 Stephanie Sersich creates Lampwork bird and flower beads, then makes cute earrings with them. Janice Peacock designs a felted flower boutonniere. 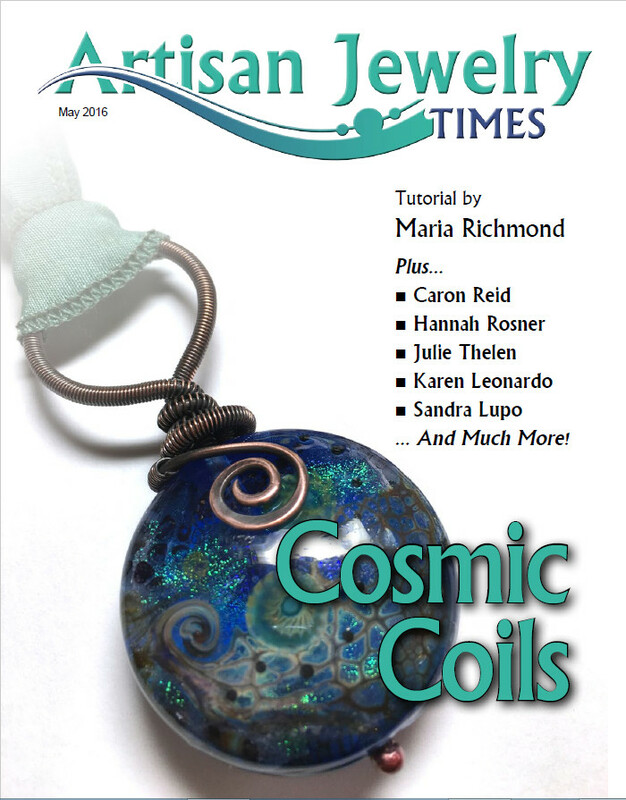 Mary Morris shows us how to add pearls and seashells to a wire crochet necklace. 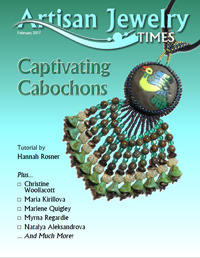 Tutorials for all the above are in the magazine. Luscious Lavender, is our color of the month. Diane Woodall discusses how to use fabric for inspiration, and Brett Levy’s article on using Mail Chimp to build your business is timely and informative. 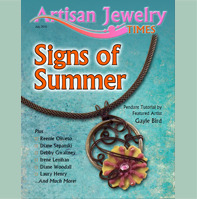 Summertime gives you more daylight in which to make your jewelry and this issue gives you a lot of new ideas with which to work. 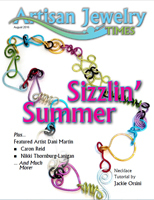 Jewelry Trends for Summer, an article by Lisa Phillips-Riser, focuses on summer trends in Jewelry; plan your mini-vacation by reading Debbie Gwaltney’s article “Mini Bead Vacay;” Gayle Bird, the featured artist shares her career as a wire artist and author; regular features: Focus on Fabulous, spotlights Holly Sokol, by Tracey Alfaro, color of the Month is Midnight Verdigris, by Diane Woodall, and Earring Inspiration (by Karen Leonardo) brings Dichroic glass to the forefront. 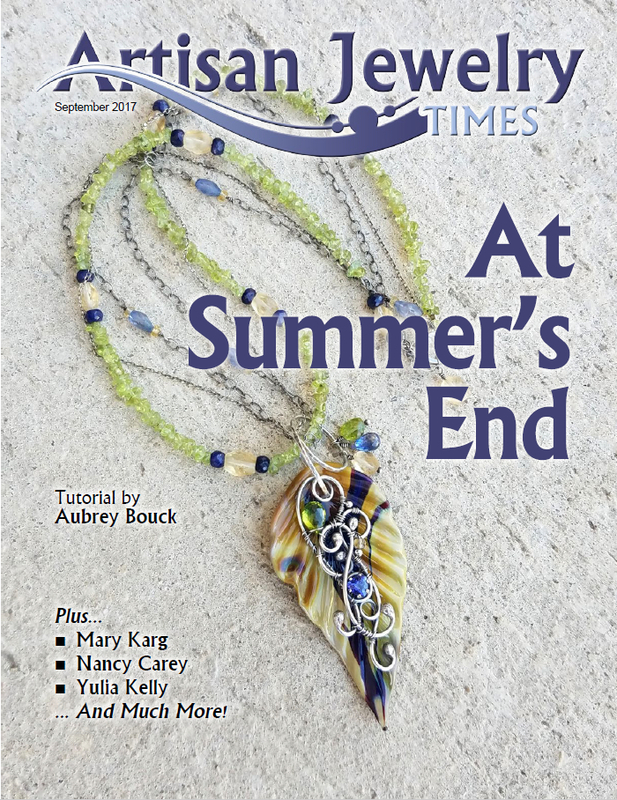 Tutorials include: Summer Pendant, by Gayle Bird; Summer Grape Leaf Earrings, by Diane Sepanski; Double Strand Knotted Necklace with Lampwork Bead and Chain, by Maureen Oliveto; Fun and Funky Flow Disks, by Diane Woodall; Bloomin’ Disk Bracelet, by Laury Henry; SuperDuo Button, by Debby Gwaltney; and Tublar Netted SuperDuo Bracelet, by Irene Lenihan. 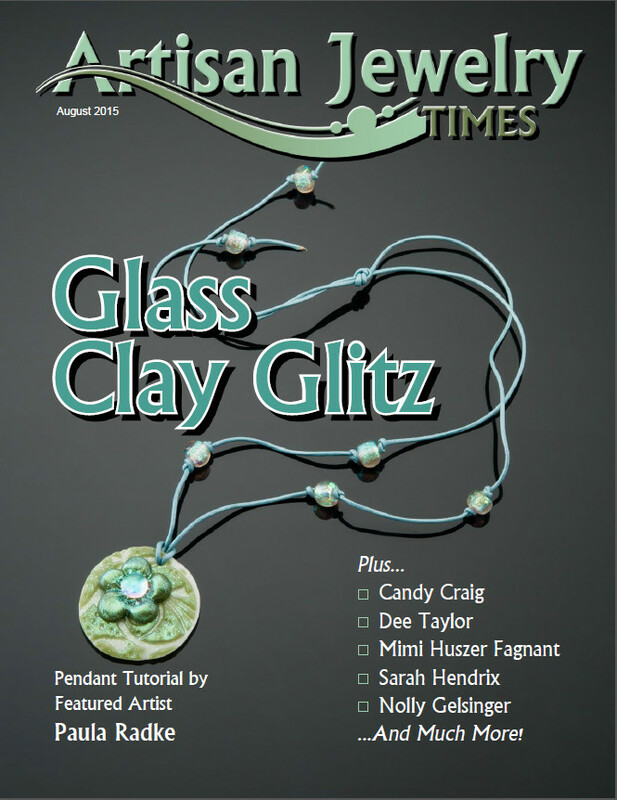 Glass Clay Glitz – Learn about “Art Glass Clay,” what it is, what it looks like, what you may do with it? 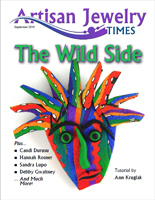 Featured artist Paula Radke created the artist-ready, off-the-shelf version. 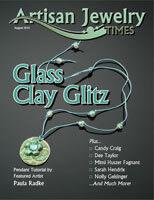 What is Art Glass Clay, it is magic; a non-toxic clay base with 99.9% finely ground glass infused. When fired the base burns away leaving pure glass fused together. 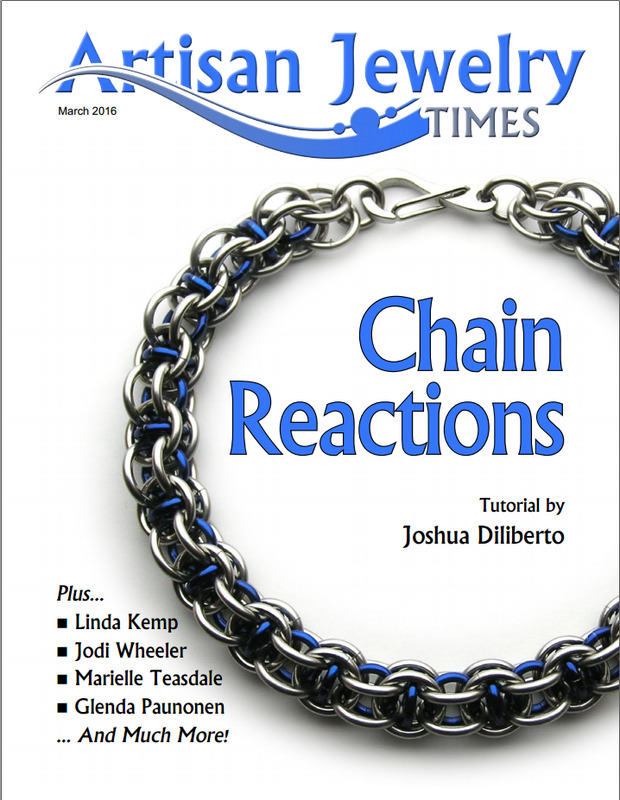 Learn more in the this issue. 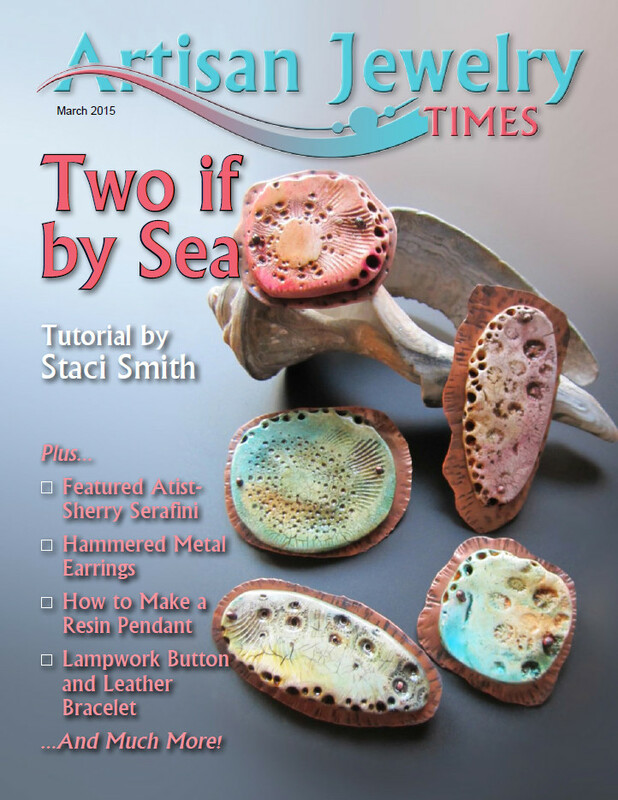 Also in this issue are articles: Combining Bead Stiches, by Sarah Hendrix; Hashtags, by Brett Levy; Focus on Fabulous, Melissa Banks, by Tracy Aflaro; Color of the Month, Petal Pink, by Diane Woodall; and Earring Inspiration, Enamels, by Karen Leonardo. 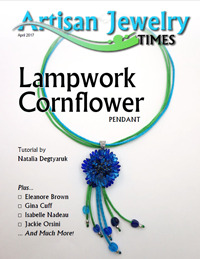 | Tutorials are: ArtGlass Clay and Dichroic Extract Flower Pendant, by Paula Radke; Two Color Dot Bead with Goldstone Accents, by Nolly Gelsinger; Tiffany Lamp Earrings, by Candy Craig; Viking Knit Bracelet, by Mimi Huszer Fagnant; and Pearls in Bloom Necklace, by Dee Taylor. 55 Page PDF. 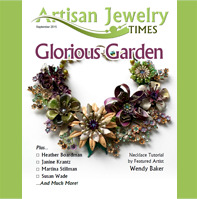 Featured Artist, Creating Flower Jewelry, Wendy Baker, by Leah Nelson | Articles: It’s Not Just About the Jewelry, by Hannah Rosner; Finding the Right Stringing Material, by Kathrine Bradley; Focus on Fabulous with Regina Krawets, by Tracey Aflaro; Color of the Month – Butter Yellow, by Diane Woodall | Tutorials: A Summer’s Garden Necklace, by Wendy Baker; Beach Party Disc Bracelet, by Heather Boardman; Wanderlust Bracelet, by Janine Krantz; Rose Cane (Polymer tutorial), by Martina Stillman; and Using Photo decals on Enamel Beads, by Susan Wade. 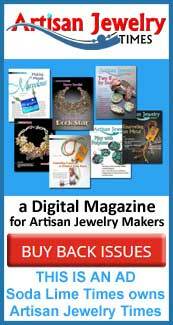 Setting your work apart in the jewelry world is critical if you want to make a name for yourself. 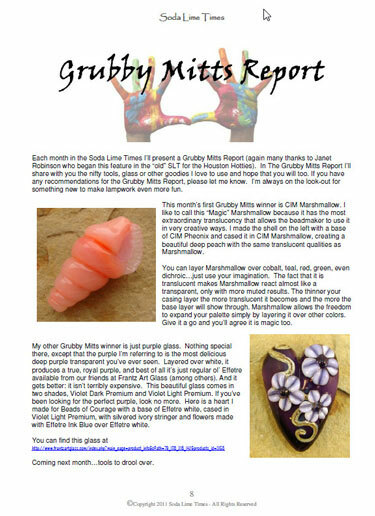 Gina Cuff, our featured artist’s story demonstrates how she did it, not by taking classes, but by reading books, experimenting and using materials not favored by others. 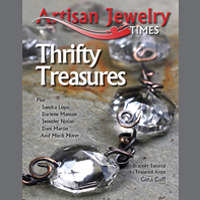 |Finding and using All Things Vintage, by Leah Nelson, shares tons of ideas on how to use vintage treasures to make outstanding jewelry. | Brett Levy opens Instagram for business to our readers. 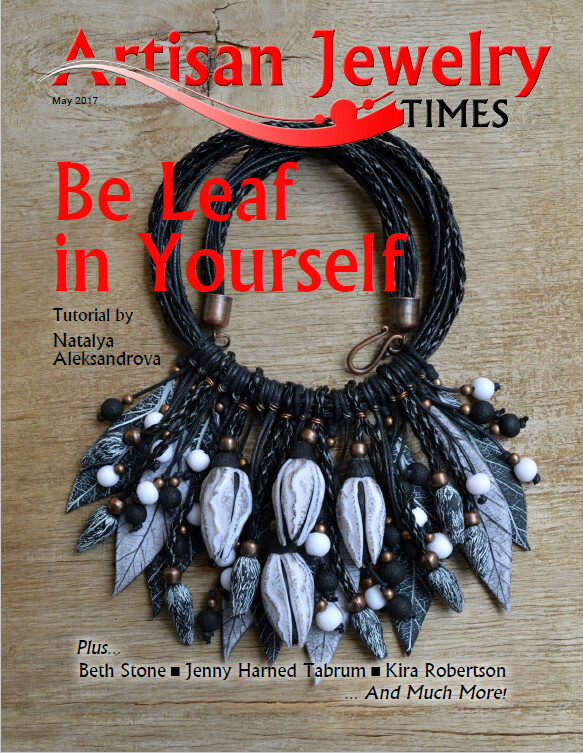 | Regular features: Focus on Fabulous shows Ljiljana Aleksandar Pezer’s fantastic work; Color of the Month makes Opulent Orange shine; and, Earring Inspiration is all about leaves for earrings. 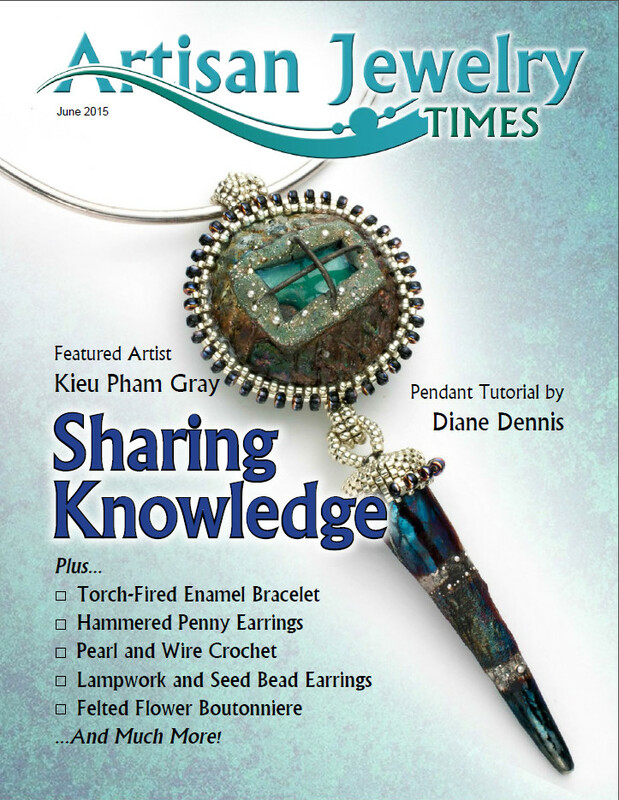 Tutorials in this issue: Faceted Glass Bracelet, by Gina Cuff; Bizzy Cuff Bracelet, by Danielle Martin; Fireflies in the Woods, by Darlene Mansue; Lampwork Glass Headpin Earrings, by Jennifer Nolan; and, Colorful Conical Earrings, by Sandra Lupo. 61 Pages. 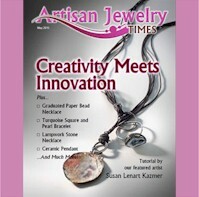 Featured Artist: Janie Krantz, shows us exceptional jewelry made by combining techniques, resulting in outstanding inspiration for not-your-grandmother’s jewelry masterpieces, that will sell well or adorn; your choice. 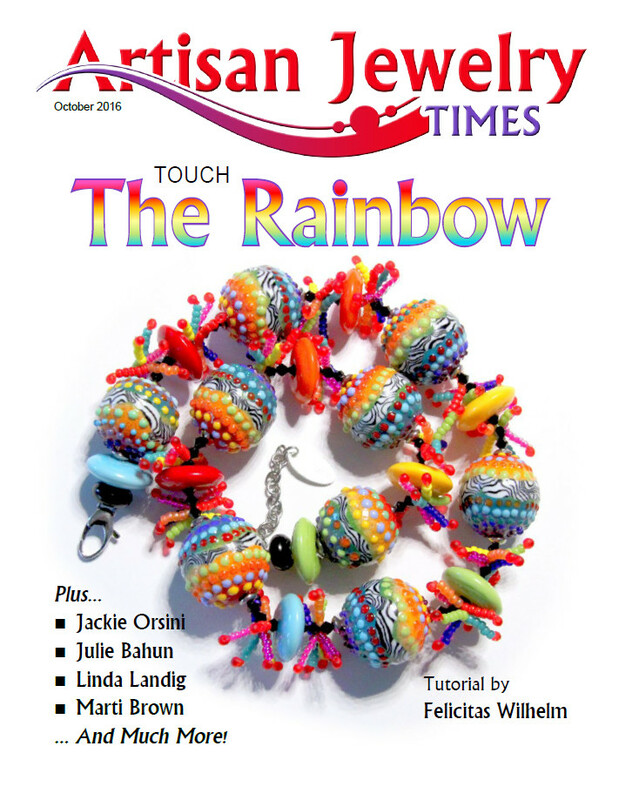 | Articles: What Every Instructor Wants to Know … About Teaching, by Holly Gage; The Making of a Bead Society: The Story of Baltimore’s Success, by Justine4 Parezo. 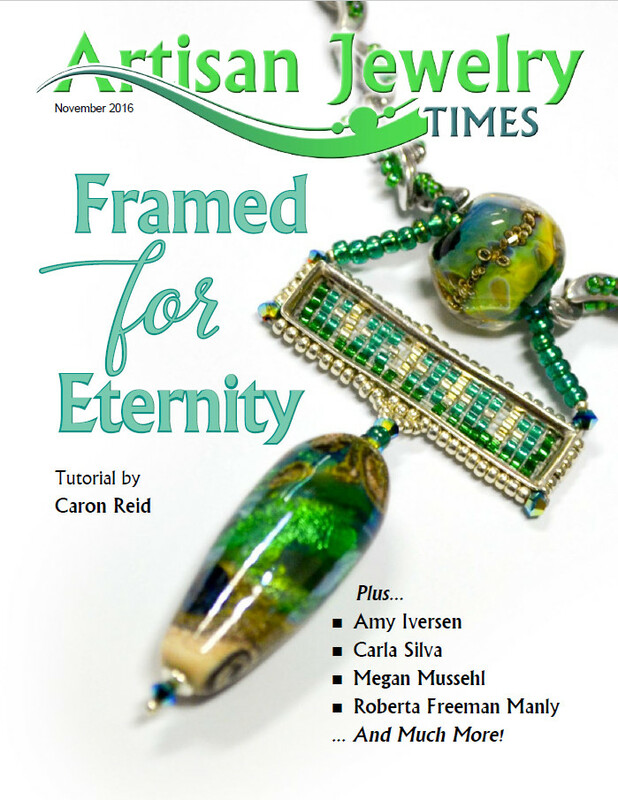 | Featues: Focus on Fabulous, by Tracey Alfaro; Color of the Month, Enticing Emerald, by Diane Woodall; Erring Inspiration, By Karen Leonardo. 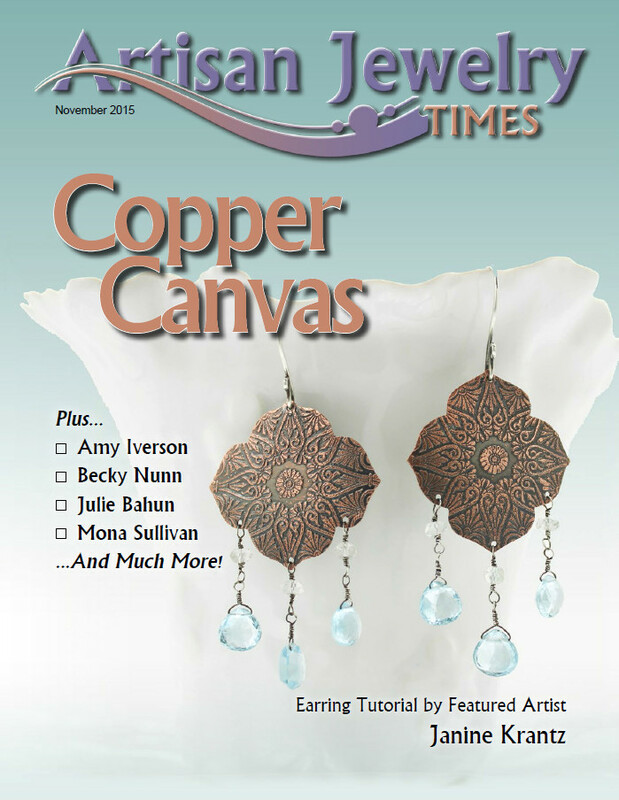 | Tutorials – Etched Copper Earrings, by Janine Krantz; Long Luscious Silver Link Necklace, by Julie Bahun; Faux Porcelain Bird Bracelet, by Becky Nunn; Heart felt Message Necklace, by Amy Iversen; and, Copper Wire Lampwork Ncklace, Mona Sullivan. | 68 Pages. 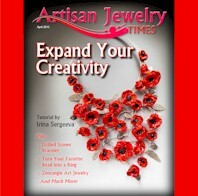 From ancient Egypt to modern art, this issue bridges time to bring you extraordinary artisan jewelry art. 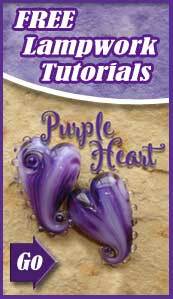 We have tutorials in a variety of mediums from glass, enamels and clay, to paper, fiber, seed beads, and more. 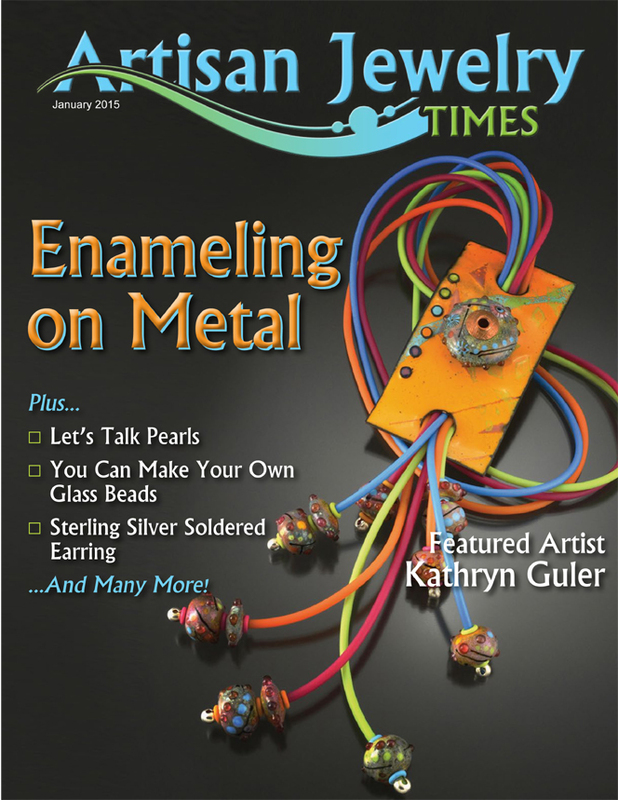 Articles include: featured artist Gill Cordiner, by Leah Nelson; the Scarab-A Bit of History, by Thea (Teddi) Fine; Impact Artist Project, by Holly Gage; Focus on Fabulous with Sally Stevens, by Tracey Aflaro; Color of the Month – Ice Blue, by Diane Woodall; Earring Inspiration – Metal Clay, by Karen Leonardo. 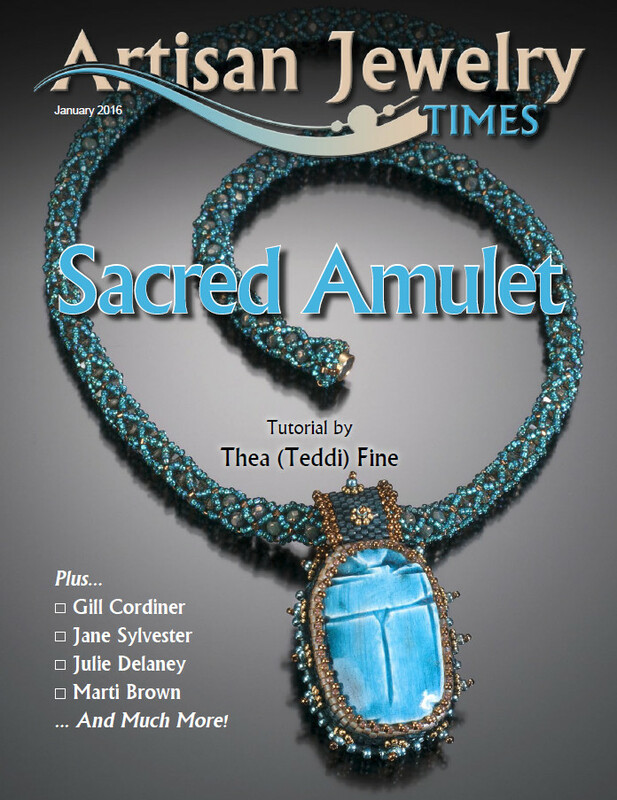 | Tutorials: Blue Wren Miniature, by Gill Cordiner; Amenset’s Sacred Scarab Pendant, by Thea (Teddi) Fine; Shake it up Necklace, by Jane Sylvester; Fused Dichroic Glass Earrings, by Julie Delaney; and, Charmed Eternally Bracelet, by Marti Brown. 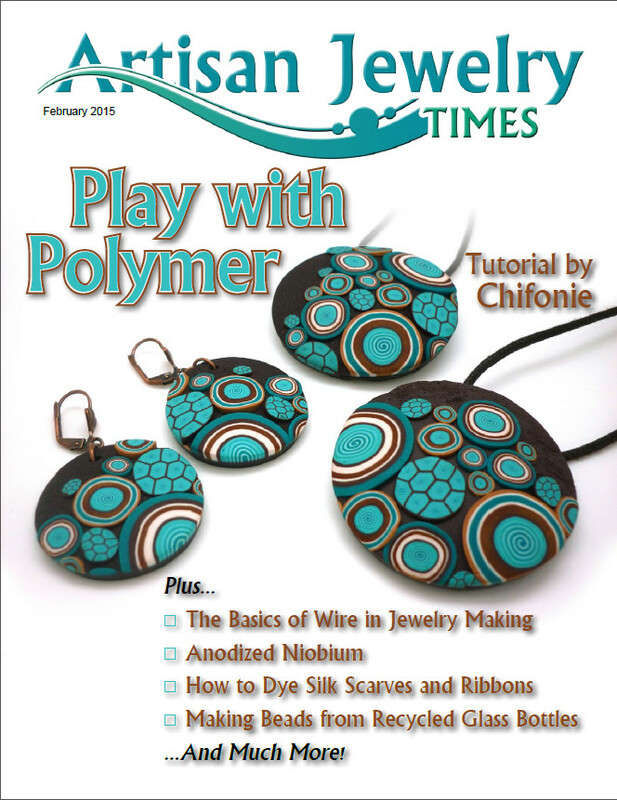 The question asked in this issue is “Why Not Learn Something New?” For instance, our featured artist, Tracey Alfaro, begins the issue by “Creating Beauty in Borosilicate,” by Leah Nelson. This magic glass is used to create some of the most fascinating jewelry you can imagine. 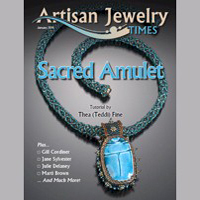 You also get a chance to meet the creators of Artisan Jewelry Times: Karen Leonardo, Leah Nelson, Debby Gwaltney, Diane Woodall, and Paul Woodall. Explore color in “Using the Color Wheel to Create Successful Designs, by Julie Couch. 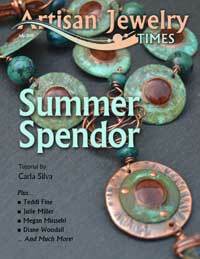 Then, look at the beauty of seed bead creations in Multi-Strand Beaded Bead Necklace, by Lynne Sausele. 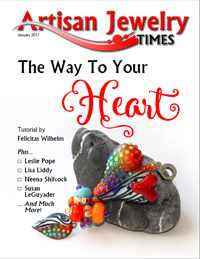 Our regular features: Color of the Month, Hot Pink, by Diane Woodall; Earring Inspiration, Hearts, by Karen Leonardo. 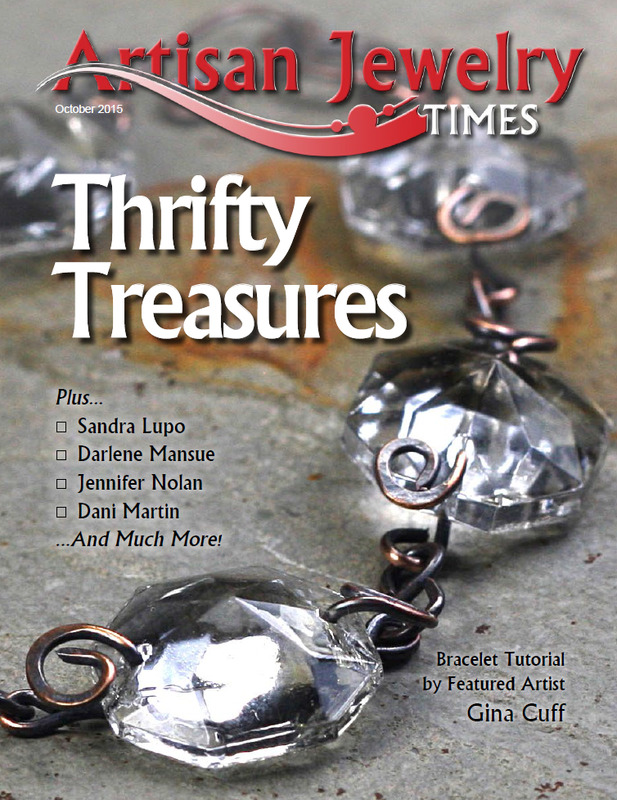 Tutorials: Clear Frit Pebbled Borosilicate Bead, by Tracey Alfaro; Williamsburg Necklace, by Tracey Alfaro; Luv Birds Cuff Bracelet, by Caron Reid; Baby Hearts Lampwork, by Breanna Daughtridge; Winter Aura Necklace, by Danielle Martin; Totally Twisted Woven Wire Earrings, by Jackie Orsini; and Textured Stacking Rings, by Janine Krantz. 67 Pages. 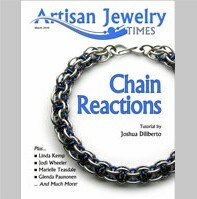 Chain-Maille is not just for jousting anymore. 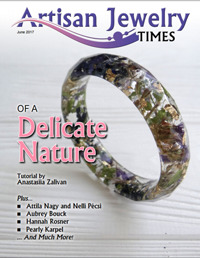 Featured artist, Joshua Diliberto, demonstrates how flexible and beautiful it can be in jewelry. 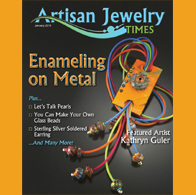 Julie Couch’s article, “Displaying Your Product as a Brand,” gives tips on eye catching displays that enhance your jewelry and your brand. You’ve got to see the legs! 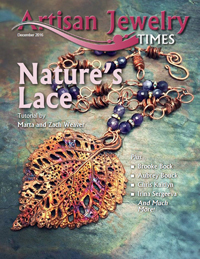 | Features: “Filigree Made Easy . . .,” by Marielle Teasdale, shows “Wow Factor” jewelry that must be seen to be believed; Focus on Fabulous, by Karen Leonardo, features Kristina Bykova’s outstanding “Forest Wire Necklace;” Color of the Month is Timeless Turquoise (in every shade); and, Earring Inspiration, by Karen Leonardo, goes “BoHo” gypsy, hippie, ethnic, rustic and organic to the max. | Tutorials: “Karma Chain Bracelet,” by Joshua Diliberto; “Antique Lace” (seed bead) bracelet, by Glenda Paunonen; “Orchid” (Lampwork) bead, and the “Silver Hammered Bracelet” on which the Orchid bead is featured, by Jodi Wheeler; “Recycled Grommet Necklace,” by Linda Kemp; and, “Spin a Silver Thread,” Filigree broach, by Marielle Teasdale, may be seen nowhere else. 79 Pages. April is the harbinger of spring, and spring means flowers. 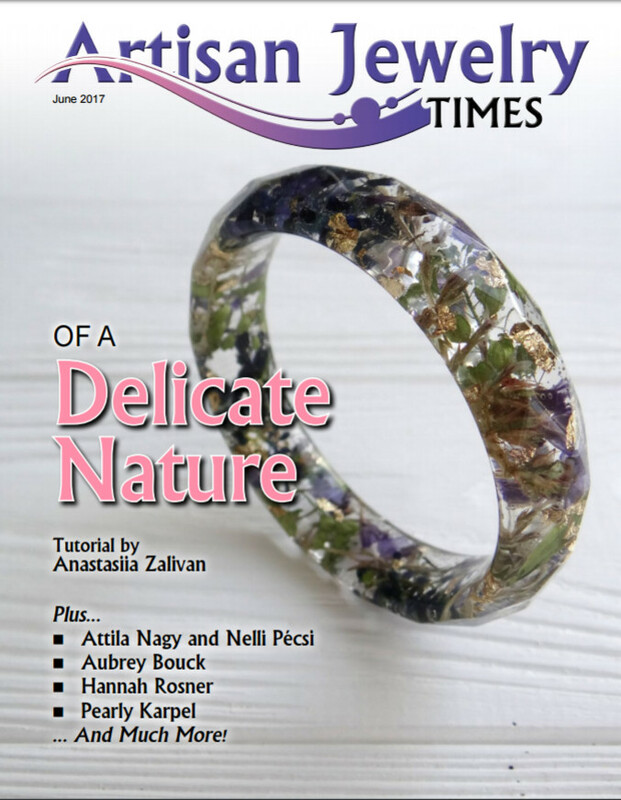 The Featured Artist, Sally Hopkins (by, Leah Nelson), creates the most amazing jewelry from (you guessed it) flowers, and other natural stuff; combining media to create some of the most amazing jewelry you have ever seen. 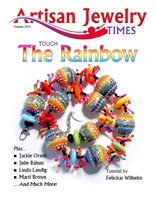 Article: Love them or be terrified of them, Know Your Seed Beads, by Sarah Hendrix, helps you tame the little critters; The American Craft Council Experience: a Bead Weaver’s Prospective, by Teddi Fine, an insider’s look at the American Craft Council show in Baltimore. | Features: Focus on Fabulous, Art Deco Surprise, by Keirsten Giles; Color of the Month, Collection of Corals, by Diane Woodall; Erring Inspiration, Fabulous Fish Earrings, by Debby Gwaltney. 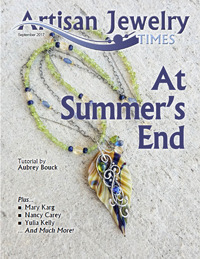 | Tutorials: Hibiscus Blossom Jewelry, by Sally Hopkins; Two to a Mandrel, Tiger Beads and Interchangeable Earring Wardrobe, by Diane Woodall and Laury Henry; Julie’s Quadra Diamonds, by Julia Kearney; Enameled Pendant and Stick Pin chain Links, by Marlene Quigley; Color of Dreams, wire wrapped earrings by Valentina Vuckovic. 64 Pages. 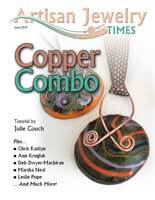 This month’s featured artist, Julie Couch, is Marrying Metal and Glass, by Leah Nelson. Julie Couch is a master lampwork beadmaker and a full time jewelry maker working with glass and metal to make truly stunning artisan jewelry. 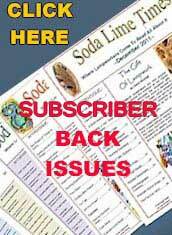 | Articles and Features: Is it Real? 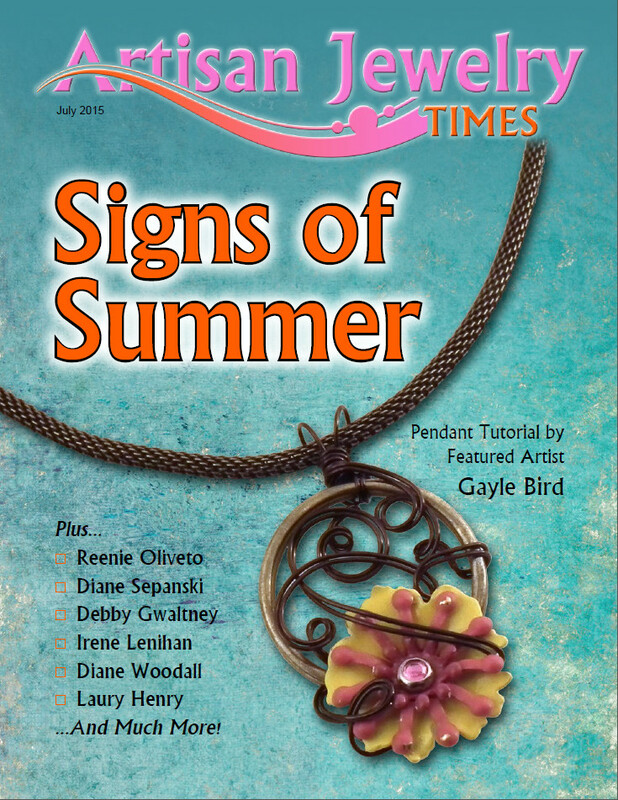 by Kieu Pham Gray; Focus on Fabulous: Liz Sabol, by Tracey Alfaro; Color of the Month, by Diane Woodall; and Earring Inspiration, by Karen Leonardo. 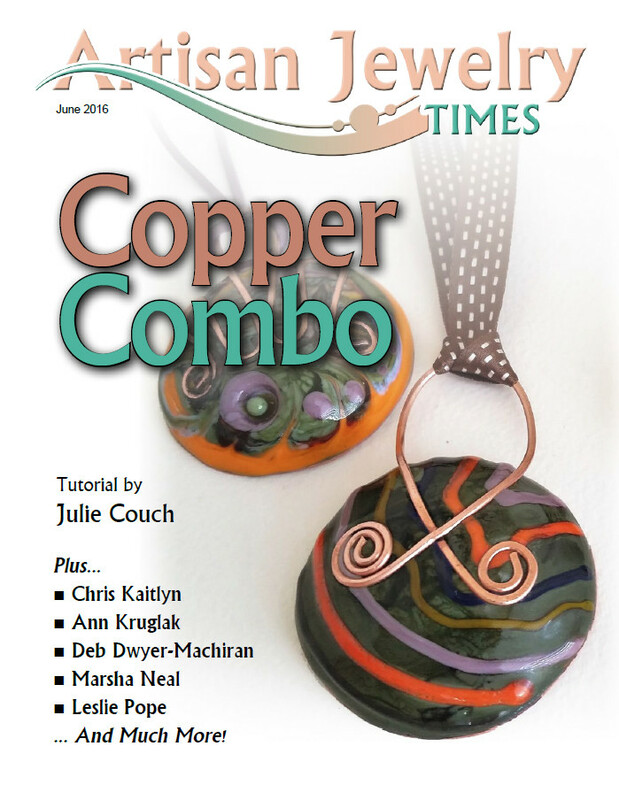 | Tutorials: All-In-One Copper and Glass Cabochon Pendant, by Julie couch; Ceramic Clay Bead Basics, by Marsha Minutella; Hot Lava Crazy Strip Pendant, by Ann Kruglak; Rustic Stone Earrings, by Chris Kaitlyn; Lariat Necklace, by Deb Dwyer-Machiran; and, Peaks and Valleys Bracelet, by Leslie Pope. | 65 Pages. Featured Artist: Dani Martin, Expressing Emotion through Jewelry, by Leah Nelson | Articles: The Molten Experience 2016, a new lampwork beadmaking camp located at Squamish, B.C., a sophisticated stocked studio with wonderful mountain views, is reviewed in detail; Herkimer Diamonds, Dig Your Own in New York, by Karen Leonardo, where you too can strike it sparkly in Herkimer diamonds. | Features: Focus on Fabulous, Italian Romance, created by Sherrie Venghaus, by Tracey Alfaro; Earring Inspiration, Clip on Earrings, featuring work by Niki Muniz, Yael Falk, Ivanna Nayda, and Noelle Lewis, by Karen Leonardo | Tutorials: Sevben Generations Necklace, by Dani Martin; Lots o Links, wire wrapping by Jackie Orsini; Twisted Stringer Bead and Wire Wrapped Ring, lampwork and silver wire by Nikki Thornburg-Lanigan; and, Adamantine, seed beading by Caron Reid. 50 Pages. Featured Artist: Julie Bahun – When Glass Meets Metal, by Diane Woodall – when lampwork beads and silver meet, the magic happens. | Articles: Multiple Hole Beads, Anyone?, by Hannah Rosner, two, three and four hole beads. 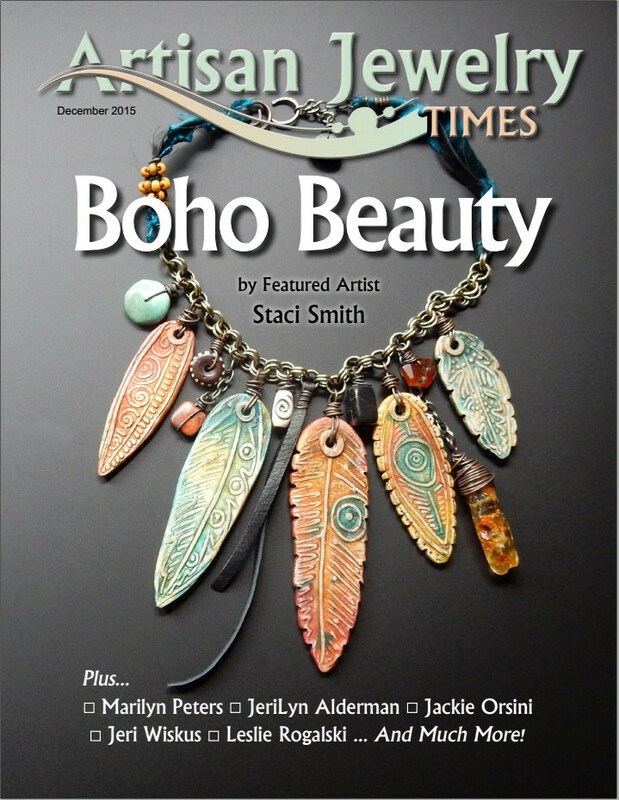 | Features: Focus on Fabulous: Red Starburst Created by Donna Greenberg, by Tracey Alfaro; Color of the Month, Autumn Glory, by Diane Woodall; Enchanted Earrings; by Karen Leonardo, featuring earrings by: Holly Stultz; Shawana Alexander; Charles and Paula Shoulders; and, Arbel Shemesh. 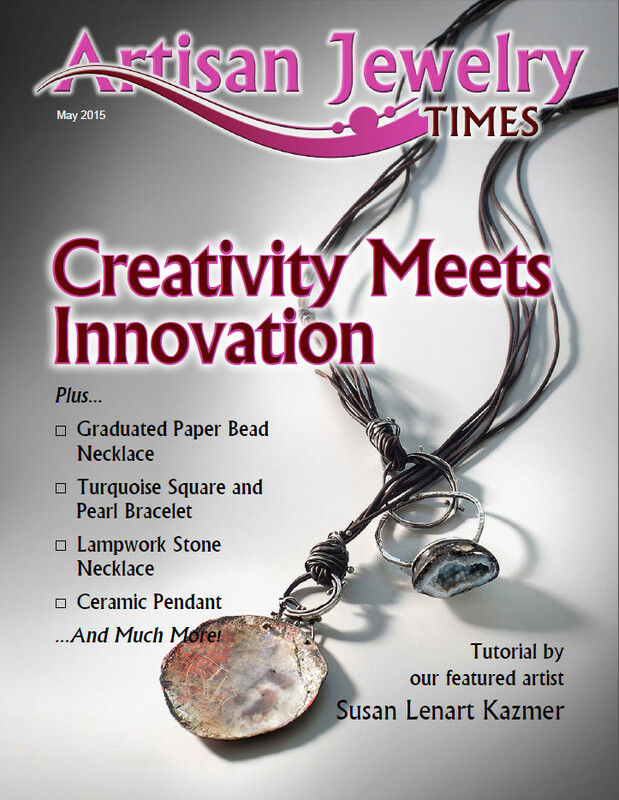 | Tutorials: Shorty Necklace, It’s all about the chain!, by Julie Bahun, Photos by Mary Louise Revese; Ceramic Autumn, Leaf Pendant, by Linda Landig; Autumn Girl Necklace, by Linda Landig; Braided Snake Choker, by Jackie Orsini; Red Cap Quartet Findings, by Marti Brown; and our cover project, Touch the Rainbow Hollow Bead Necklace, by Felicitas Wilhelm, photos by Dieter Wilhelm. 69 Pages. 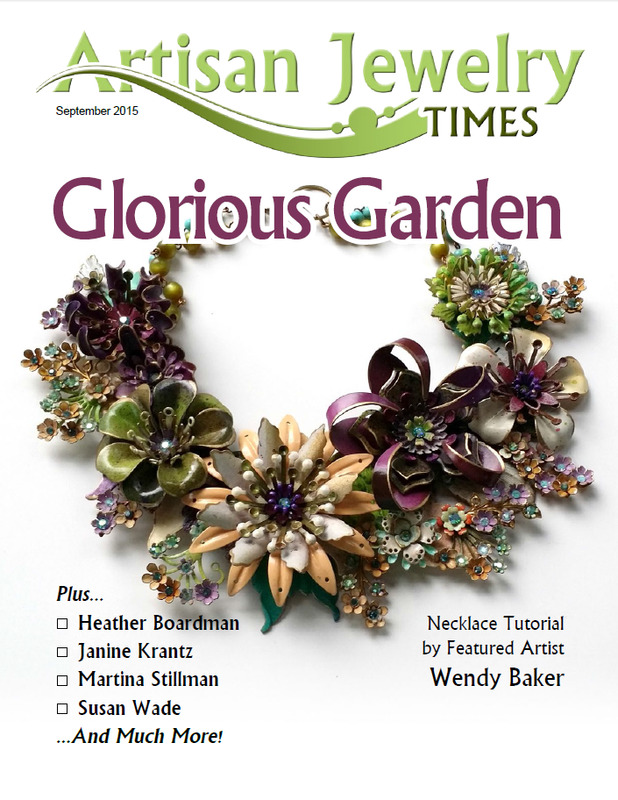 If you like seed beading you are going to love this issue. 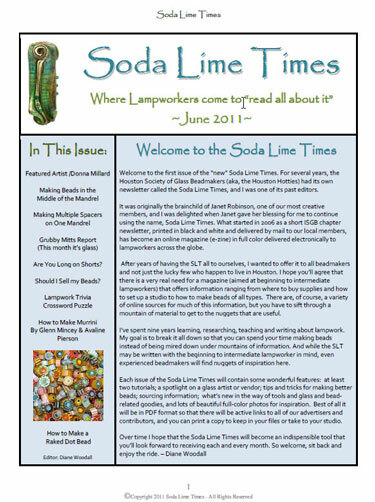 At least half the issue has seed beading in one form or another; and, some really extraordinary work in other areas throughout the magazine. 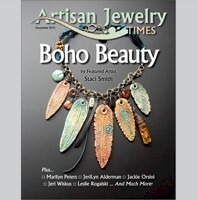 Featured Artist: Hannah Rosner, by Diane Woodall | Articles and Features: Styles of Enameling, by Christine Woollacott; A Peyote Beader’s Paradise: The Creation of a Beaded Artifact Android App; Focus on Fabulous, Tracey Alfaro; Spotlight On, by Tracey Alfaro; Earring Inspiration, by Karen Leonardo | Tutorials: Turn a Pretty Cabochon into a Pendant, by Hannah Rosner; Brilliant Color: Creating a Cloisonn Pendant in Metal Clay, by Christine Woollacott; Spring Flowers Necklace, by Maria Kirillova; Leather Sgraffito Bracelet, by Marlene Kazor Quigley; Tibetan Style Polymer Clay Bead Necklace, by Natalya Aleksandrova. 71 Pages. 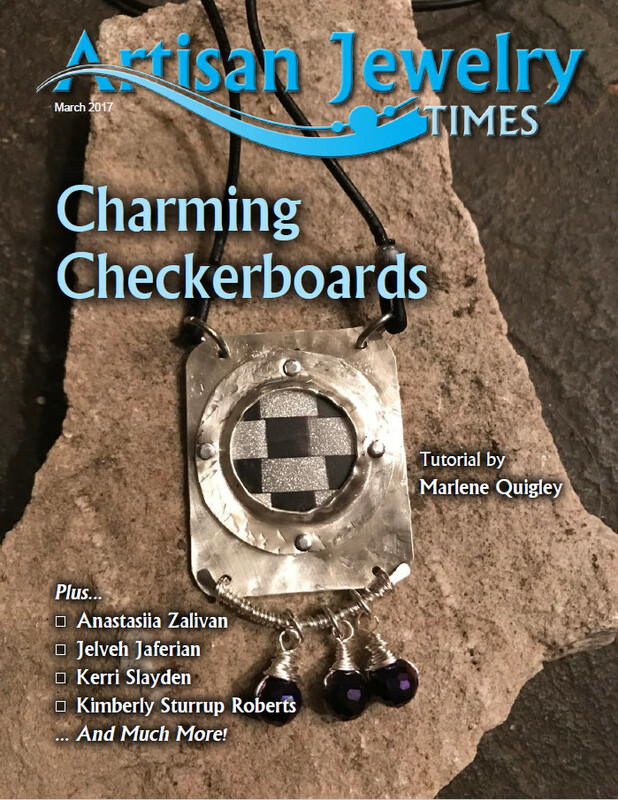 Featured Artist: Marlene Quigley (working with metal), Listen to Your Inner Voice, by Diane Woodall; Articles: Facebook Sales Groups, (Want to start a group?) What is it like to be an Administrator? By, Stacey Kroft | Features: Focus on Fabulous: Doesn’t Time Fly (OMG), a Steampunk masterpiece, created by Lauren MacGregor, by Tracey Alfaro; Spotlight On – Wickedly Wired – Cassandra Dillavou, by Tracey Alfaro; Earring Inspiration, by Karen Leonardo: Tribal Earrings featuring work by Gloria Ewing, Emily Greer, Tatjana Pudlo Stanimirovic; and, Karen Bucci | Tutorials: Checkerboard or Basket Weave Pendant, by Marlene Quigley; Under the Sea Ring, by Anastasiia Zalivan; Organic by Feel, by Jelveh Jaferian; Wire-Wrapped Horse Pendant, by Kerri Slayden; and, Sea Treasure Necklace, by Kimberly Sturrup Roberts. 62 Pages. There’s a little something for everyone in this issue: wire wrapping, seed beading, lampwork, polymer Clay, and even Fiber Beads. No one should go home hungry. 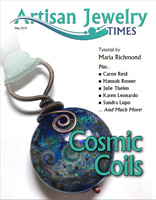 Featured Artist: Jackie Orsini, and How to Write a Great Tutorial, by Diane Woodall | Focus on Fabulous and Spotlight On, by Tracey Alfaro, Earring Inspiration, by Karen Leonardo | Tutorials: Coilique Bracelet and Earring Set, by Jackie Orsini; Fiesta Fiber Bead Necklace and Earring Set, by Eleanore Brown; Polymer Clay Heart Pendant, by Gina Cuff; Sunset Earrings, by Isabelle Nadeau; Lampwork Cornflower Pendant, by Natalia Degtyaruk. 57 Pages. Autumn in the air, and autumn designs on the mind. 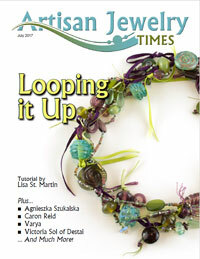 Featured Artist, Aubrey Bouck, Wired for Success, by Diane Woodall; Article: How to make Handmade Jewelry that Stands Out and Sells Out, By Erin Mooney; Tips to Boost Creativity, by Darryle Jadaa | Features: Focus on fabulous, Bottle Blues, by Kristen Frantzen Orr; Spotlight On Ravens Meadow, by Nicole St. Laurent; Earring Inspiration, Nadya Sivers, Aimee Mitchell, Greta Tulner, Shi Eddy | Tutorials: Farewell to Summer (a long tutorial), by Aubrey Bouck; T-Bone Drop Beaded Pendant, by Mary Karg; Purple Dichroic Fused Glass Earrings, by Nancy Carey; Crystal Epoxy Resin Sphere Earrings (Dry Natural Moss and gold Leaf), by Yulia Kelly. 69 Pages. 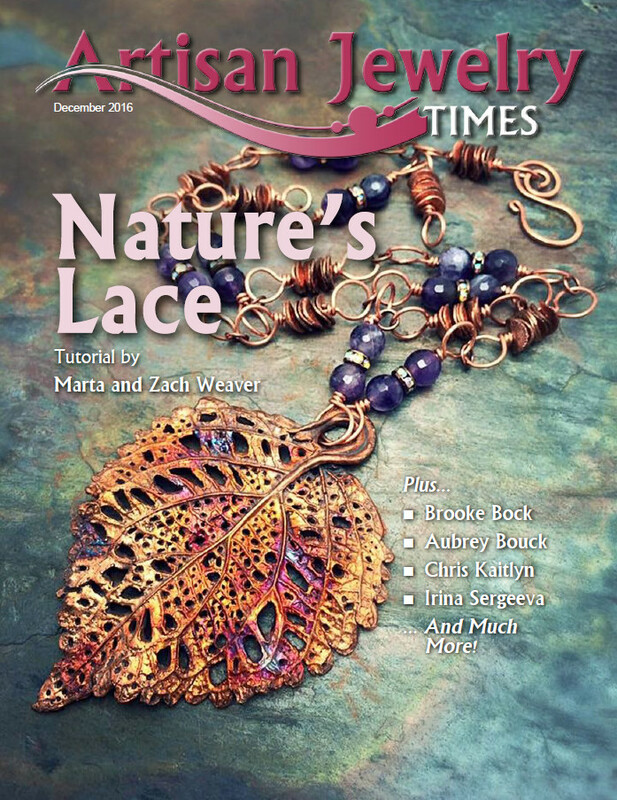 Featured Artist, by Mary Karg, Have Metal, Will Travel; Sugar Skulls, Love Never Dies, By Monica Pryor (beads by Sabrin Koeble; From Portraits to Pendants, by Patsy Oxley | Features: Focus on Fabulous – Lord of the Rosehips. 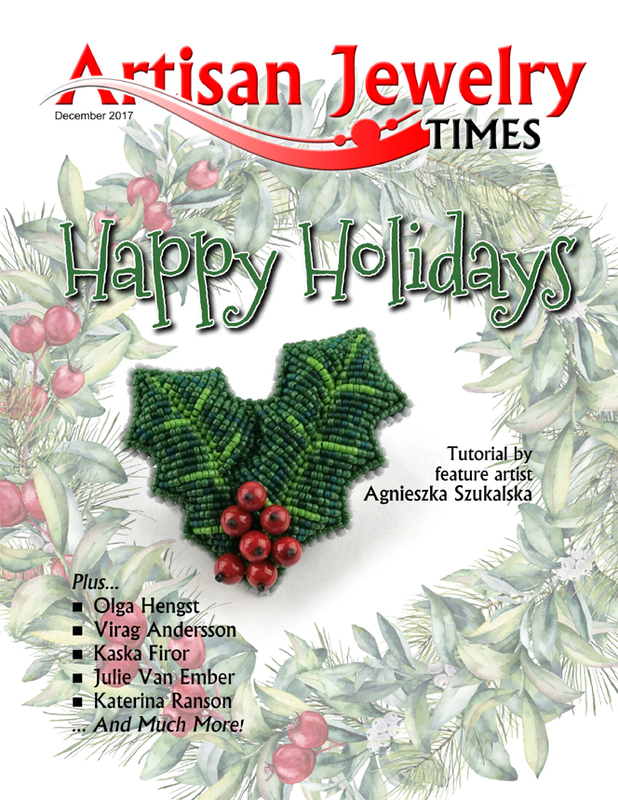 By Anna Dubinskaya; Spotlight On, One Sweet Bead – Stacey and Paula Kroft, by Tracey Affaro; Earring Inspiration – Horror – Ific, by Karen Leonardo, featuring earrings by Lea Ployakov, Anna Siivonen, Marijana Loncar Desancic, Dante and Sabrina Acevedo | Tutorials: Tangle Disc Earrings, by Mary Karg; Crazy Daisy, Polymer, by Anna Borysewicz-Segit; Moon Earrings, By Elzbieta Frydel; Half-Circle Enameled Copper Earrings, with beaded dangles, by Katherine Fathi; Watercolor Flowers Necklace, by Olga Kravchenko | 75 Pages.